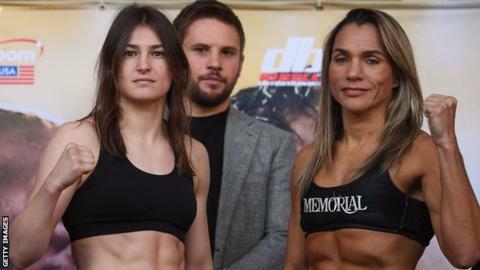 Katie Taylor is determined to avoid complacency in Friday night's world title unification fight against Rose Volante in Philadelphia. Victory for Taylor would set up a fight with WBC champion Delfine Persoon in June before a showdown with seven-weight world champion Amanda Serrano. Undefeated WBA and IBF world champion Taylor is expected to overcome WBO holder Rose Volante. "I think the time you get complacent is the time you lose," said Taylor. The 32-year-old London Olympic goal medallist could earn her first $1m purse in a super-fight with Puerto Rica's Serrano. Volante is also unbeaten and Taylor is not underestimating the threat posed by the Brazilian. "I think she's a very, very good boxer - she's very strong, she has a big right hand and she's dangerous," added Taylor. "I definitely can't relax in there against her. I know that if I fall asleep against her, she can catch you and she has hurt all of her opponents. "I think it's going to be a huge fight, and I think a very entertaining fight, and possibly a very physical fight too, for the 10 rounds. "I am well prepared for this kind of challenge and I'm looking forward to it."